Escape the tourist hordes and cycle through the island’s heart, from the green hills of Ubud to the laidback beach towns of Lovina and Sanur. Om Swastiastu! Welcome to Ubud, the arts and cultural centre of Bali. Your adventure begins with a welcome meeting at 6 pm. Afterwards, perhaps head out to Gianyar night market. It’s an informal setup, but a great way to get a taste of the local culture and cuisine. Please look for a note in the hotel lobby or ask reception where the welcome meeting will take place. If you can’t arrange a flight that will arrive in time for the welcome meeting, you may wish to arrive a day early so you’re able to attend. We’ll be happy to book additional accommodation for you (subject to availability). If you’re going to be late, please inform the hotel reception. We’ll be collecting your insurance details and next of kin information at this meeting, so please ensure you have all these details to provide to your leader. After visiting Tirta Empul we slowly make our way back to Ubud, (approx. 16 kms, mostly downhill) taking quiet roads back past lush rice fields. Here we visit Bumi Sehat, a Foundation dedicated to providing access to quality healthcare to families; and hygienic and culturally appropriate childbirth to traditionally under-represented populations. This evening why not enjoy all that laid-back Udud has to offer, from a traditional Balinese Kecak dance to sampling local delicacies at the Night Market. In the afternoon, you can laze at the hotel or take the option of hopping into a boat for a quick visit to a most unique local village, Trunyan. What sets this village apart from others is its fascinating way of dealing with the deceased; instead of the conventional Hindu tradition of cremation, bodies are put under the ‘Kayu Menyan’ tree which is said to absorb the odour. Be warned though, this can be a challenging experience. There’s the option of climbing Mt Batur beforehand. Those that choose this optional activity will get up in very early morning (3 am) for the climb, which reaches 1717 metres above sea level. It’s quite chilly at this early hour – usually somewhere between 8°C and 12°C, so dressing in layers is essential to deal with the sharp rise in temperature later on. A 15-minute drive leads to the starting point, and the climb itself takes around two hours, with an additional 30 minutes to get to the summit if you choose (refreshments are available at the top). The sunrise rears its head at around 6:15 am, after which many cheeky monkeys show up in search of food. You can also visit the nearby cave, where the Balinese come to worship twice a year; from here you can see the steam of the crater rise. For those not doing the optional climb you can sleep in a little before the ride to Bedugul begins. Today’s ride starts out flat before a slight uphill but it’s worth it! From here you enjoy over 30kms of mostly downhill, cycling past orange and coffee plantations all the way to our lunch stop.After lunch it’s an uphill ride to Bedugul, a sleepy village at the edge of the crater lake of Bratan (Lake of Holy Mountain). 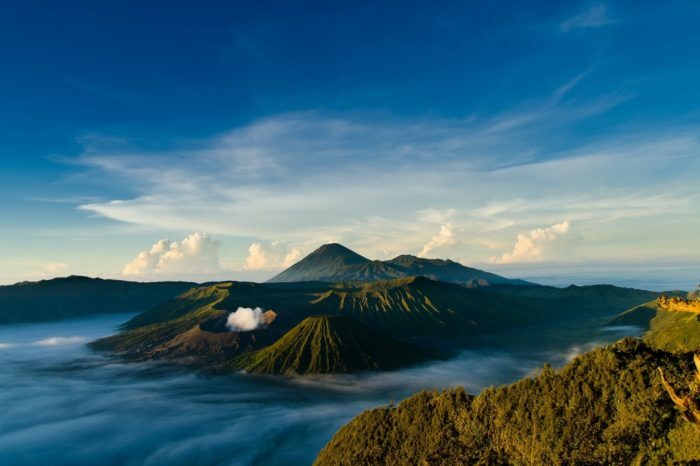 An area of great natural beauty, at 700m above sea level it makes for a refreshing change from Bali’s constant humidity. Cycle from Bedugul to beachside Lovina today (approximately 60 km). The roads are mostly downhill and has some beautiful views to enjoy. 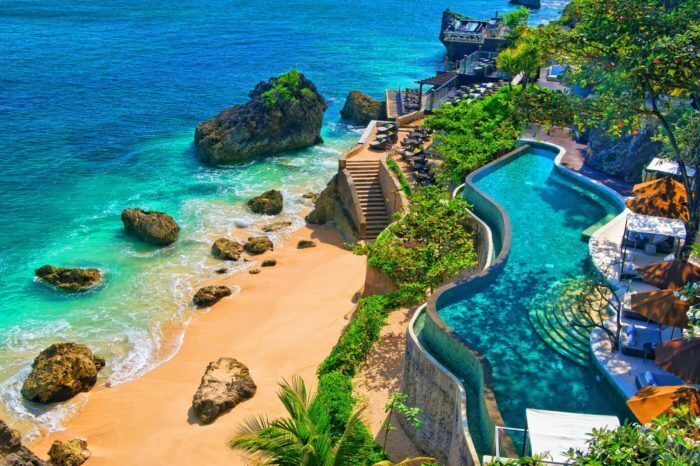 Along the way visit one of the main temples in Bali, Ulun Danu Baratan. 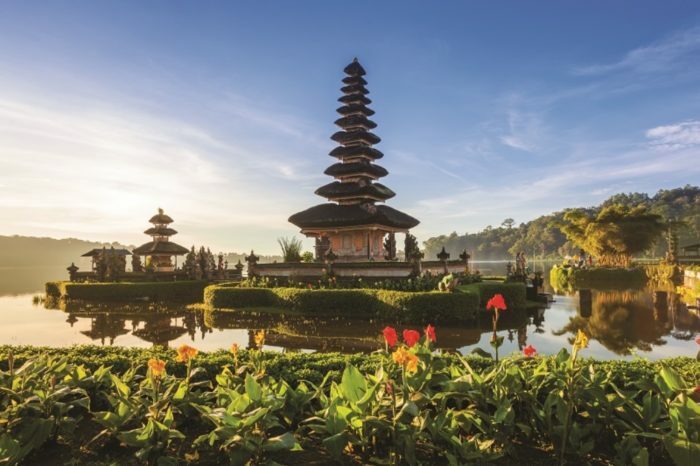 Appearing to ‘float’ on the lake, the 500-year-old temple is dedicated to Dewi Danu, the water goddess, and ceremonies are held here in the name of water supply to Central Balinese farmers. Spend around an hour checking out the temple, then ride on the traditional market– a good place to pick up a mangosteen to snack on (or a durian, for those who can handle the aroma! ).Continue cycling through this beautiful countryside, stopping to admire the other two crater lakes of Buyan and Tamblingan before stopping at the most scenic waterfall in Bali – Munduk waterfall. Set among lush forest it is a wonderful place to cool off before cycling onwards through cloves plantations all the way down to the unique black volcanic sand shores of the Bali Sea and laidback Lovina. Coast downhill (approx. 10kms) before joining a busy road to the small village of Meliling (approx. 11kms) before continuing south a further 18kms to Tanah Lot, and a visit to the legendary Tanah Lot Temple (which translates literally ‘island on the sea’). It’s a popular but beautiful spot to see the sunset. Your accommodation tonight is a short drive from Tanah Lot.